Home » Health » What Is Amputation? Amputation is the loss of body parts, such as fingers, legs, or arms due to injury or occurs in a planned manner through surgical procedures, for example to prevent the spread of infection. Parts of the body that are completely cut off, such as fingers that are broken due to injury, can sometimes be reconnected. This can be done if the disconnected part gets the right treatment. Under partial or still there are some soft tissues connected to the patient's body, it is still possible to reconnect. However, depending on the severity of the wound experienced by the patient. Accidents at construction sites or related to work. Amputation due to war wounds ( combat related trauma ). These conditions include a landmine explosion or exposed to shrapnel, causing the body parts to be destroyed or disconnected. Frostbite . Injury to the body due to exposure to cold temperatures, which can make the body freeze and experience tissue death. Peripheral arterial disease (PAD), the obstruction of blood circulation due to narrowing of peripheral blood vessels. This condition can cause the body tissues that get blood flow can be infected or die. Peripheral arterial disease is one of the most common causes of amputation. Diabetes, can lead to complications called diabetic neuropathy . Diabetic neuropathy can make the legs numb, so that if any injuries to the foot tend to be neglected and become infected. In addition, blood flow in the diabetic foot is reduced, thereby slowing wound healing and infection, as well as causing gangrene . Osteomyelitis, an infection that occurs in bone. Amputation may be performed if the treatment is ineffective and the infection is spreading. Soft tissue infections, such as necrotizing fasciitis , are bacterial skin infections. This infection spreads rapidly and kills the soft tissues in the body. Sarcoma, a cancer that arises from various body tissues, such as muscle, connective tissue, or bone. Xenomelia or body integrity identity disorder, which is a disorder that occurs when a person performs an amputation of a healthy part of the body. No known cause of this disease, but suspected of neurological or psychological disorders. Pain. The degree of pain is not always proportional to the severity of the injury or bleeding. Bleeding. The severity of bleeding depends on the location and type of injury experienced. Body tissue damaged or crushed. The tissues of the body are damaged, but some tissues may still be connected to the muscles, bones, joints, or skin. Denial. Forms of refusal to engage in discussion or refuse to ask questions regarding planned procedures. Anger. Generally addressed to a team of doctors who suggest to perform amputations. Bargaining. Trying to prevent the operation or delay it indefinitely for various reasons. Depression. The patient feels no one can help him to prevent amputation. For people who have an amputation due to injury, may not go through the stage of grief. However, an examination of possible symptoms of post-traumatic stress disorder ( PTSD ) may be necessary to prevent psychological complications. Check the breathing and heartbeat of the victim. If necessary, perform cardiopulmonary resuscitation (CPR). Make an effort to calm the victim. This is necessary because amputation conditions are very painful and frightening. Take action to stop the bleeding by pressing the wound directly. Elevate parts of the body that have amputations. If the bleeding is still going on, check the source of the bleeding and put pressure on the source of the bleeding. If the victim experiences severe and life-threatening hemorrhaging, use bandages or bushes, and cover the wound firmly. However, the use of bandages should not be in the long term, because it can endanger the victim. Keep the broken body parts and make sure there is someone who always accompany the victim. Then clean the broken part of the body slowly. Wrap the disconnected body part with a clean wet cloth, then put in a tightly sealed plastic and place the plastic in a container of ice water. Do not place body parts that are disconnected directly without using plastic and do not use dry ice . If no cold water is available, keep as much of the body as possible away from the hot stuff. Bring it to the hospital or keep it well until the medical team arrives. Cool the amputated body parts, so that the separate parts of the body still allow it to be reconnected. Without cooling, amputated body parts can only last 4-6 hours to be reconnected. However, keep the remaining body parts warm. Take steps to prevent shock. Lay the victim in a flat place, lift the legs about 30 cm, and cover the victim's body with a blanket. Do not position the victim in this position if the patient has a head, neck, back, or leg injury, and also if this position makes the victim uncomfortable. When bleeding can be stopped, check the condition of the victim if there is a sign of injury that requires immediate treatment. Perform good handling of broken bones, tear wounds, and other injuries. Accompany the victim until medical help arrives. Do not forget that saving someone's life is more important than saving a broken body. Do not neglect other minor injuries. Do not be too forced to restore body parts to the original place. Do not assume that the broken part of the body is too small to be saved. Do not use dyed fabrics, except in great bleeding conditions that threaten the person's soul because all parts of the body can be threatened. Do not give bad hopes to amputation victims. Emotional adaptation. Losing parts of the body will cause the patient to experience depression . Consulting with a doctor or discussing with other patients will help to overcome the sense of loss experienced by the patient. Support from family and close relatives is also able to help the patient through difficult times. Over time, patients will be able to adjust to changes in appearance and find new ways to perform daily activities. Phantom limb sensation is a term used to describe the type of sensation commonly experienced by patients in the amputated limbs. When the patient experiences phantom sensation , the patient will feel that the amputated limb is still present. This condition is not a psychiatric disorder, but a brain response that still feels the presence of missing body parts. As long as this sensation does not cause pain or harm to the patient, the patient does not require special care. Pain. Most amputation patients experience pain in the remaining limbs or limbs. Pain can be caused by impaired blood circulation and nerve damage due to diabetes. Consult the pain experienced by the patient to the doctor before the pain gets worse. The exercises run with or without aids. Manage and maintain the prosthesis. Caring for and maintaining the remaining limbs. Prosthesis. 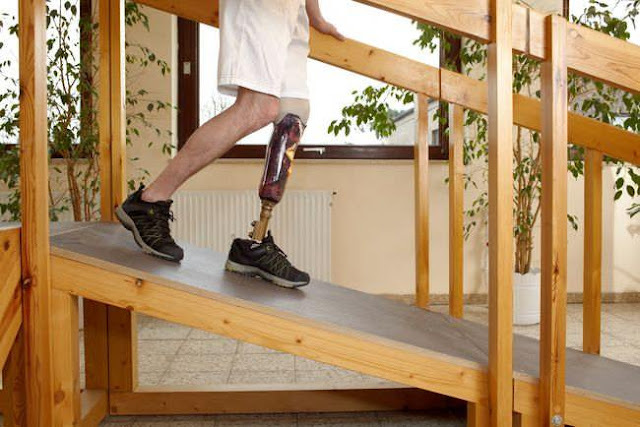 The prosthesis is able to replace the function and appearance of the lost limbs. This type of prosthesis is generally adapted to the shape and size of the remaining fingers, hands, arms, legs or limbs, as well as the daily functional requirements of the patient. Preparation of the protesis is usually done by casting techniques or computerized methods that are tailored to the patient's body part. Generally, patients will be trained in the use of prostheses and instructions for treating the remaining limbs or body parts. Damage of blood vessels and nerves. Phantom limb pain , ie pain that is felt in organs that are no longer owned. Pain around the amputation area. Suture wounds look red, swollen, or bleed. Healthy parts of the body experience numbness or tingling. Formation of fluid or pus. Check your feet regularly every day. Do not underestimate the pain in the legs. Make sure the floor is free of sharp objects. Always use footwear, including at home. Buy comfortable shoes and socks, and check them before use. Immediately contact your doctor if your leg is swollen, flushed, or changes in size or shape. Provide training and safety practices to employees. Wearing protective equipment when in a risky work area. Use a tool or device to prevent direct contact with a dangerous machine, such as a grinder, cutter, or driller. Children (under 18 years of age), are forbidden to work on dangerous machines. 0 Response to "What Is Amputation?"